He made a cameo appearance along with Jamie Hyneman on CSI: Crime Scene Investigation on the May 1 2008 episode "The Theory of Everything. He is a practiced juggler as seen on Mythbusters. Savage also stated that such an episode is unlikely because MythBusters has a policy against trying to disprove supernatural phenomena. His model work has appeared in major films including Star Wars: Episode II - Attack of the Clones and The Matrix Reloaded. He lives in San Francisco with his twin sons and wife Julia. 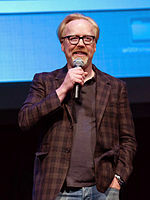 Adam Whitney Savage (born July 15 1967) is an American industrial design and special effects designer/fabricator actor educator and co-host of the Discovery Channel television series MythBusters and Unchained Reaction.